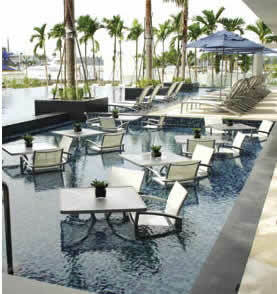 The new ONE° 15 Marina Club in Singapore is shaping up to become one of the region’s latest ‘must visit’ society hotspots – a unique and exclusive club for yacht owners, crews and those who love and embrace the waterfront lifestyle. Named after its strategic location, one degree 15 minutes North of the equator, ONE°15 is situated at the heart of the exclusive Sentosa Cove enclave that is developing as one of the world’s most integrated waterfront lifestyle communities. If your idea of a Yacht Club is a traditional atmosphere of trophy cabinets, an engraved board with a list of commodores going back to the days of racing smacks and paid hands, and a smoky bar with crusty old seadogs swapping yarns, you won't get it at ONE°15. For this is something straight out of modernist cyberspace and geared to the needs of the 21st century; more Wally Yacht than Camper and Nicholson. ONE° 15 is the brainchild of Singaporean Arthur Tay, who has thrown all of the old traditions out of the box to produce a club that in every way is the epitome of the modern Asia – dynamic, innovative and, above all, luxurious. Asians are the supreme followers of prestigious luxury branding, as the old class structure has disappeared to be replaced by the display of wealth as the benchmark of class. In Asia, if you have wealth you have it on display as proof, hence the rise of Asia as one of the world's biggest markets for designer goods and services, within which ONE°15 Marina Club has been clearly positioned to be a part of. Standing by the marina basin in front of his clubhouse, Chairman Arthur Tay explained the charm of Asia’s new lifestyle destination, “The ONE°15 Marina Club brings together all of the elements of the new waterfront lifestyle that is fast emerging in Singapore. The ONE°15 Marina Club will be more than a world-class marina where you can admire some of the world’s most beautiful boats and mega-yachts, it will be the place to hang out with the 'who's who' in the industry and society, watch the sunset and appreciate the finer things in life". Any doubts that this formula is unworkable were dispelled with a stay at the club in the soft opening period, prior to the official opening at the end of September. The service from the multi-cultural staff and the quality of the food was excellent, despite the club still building up to full operations. Conveniently located just ten minutes away from the Central Business District of Singapore, the ONE°15 marina has berths for 270 boats, including 13 for superyachts up to 80 metres in length. As expected for such a prestigious property, the extensive member facilities include a designer infinity pool, spa, fully equipped fitness centre, ballroom, bars, formal Chinese restaurants and a more casual Bistro. Accommodation for members is well catered for, with 24 deluxe rooms, four suites and, uniquely for Singapore, there are two plush houseboats each with four cabins. 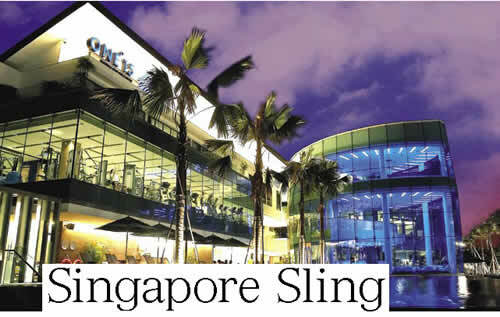 Overnight accommodation starts from SG$380 per night (US$250). ONE°15 is exclusively for members and guests, although visiting yachts are welcome and berthing fees include temporary club membership. Membership numbers are currently quoted at just under 2,000 and the list is to be capped at 4,000 members, with membership transferable after three years. Getting in on the scene, the membership entrance fee makes the most of the lucky Chinese number 8 and is priced at SG$38,888, (US$25,650) having increased from the launch price of SG$23,888 (US$15,750). 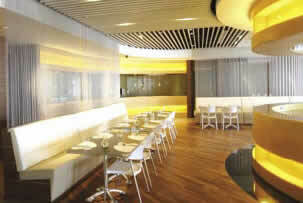 This is joined by a monthly fee of SG$95 (US$63). Although there is a sprinkling of sailing yachts in the marina basin, Asia is predominately a power boater’s base and ONE°15 is uniquely placed as a gateway to one of the world’s last relatively undiscovered cruising grounds, the Riau Islands of Indonesia, some 20 miles south. ONE°15 is also the venue in April for the annual Boat Asia exhibition, which this year hosted over 40 boats on water and greeted 10,000 visitors. 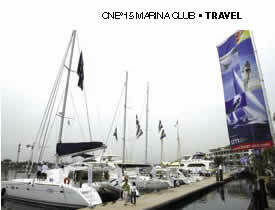 ONE°15 Marina Club fits in with the way Singapore is fast re-inventing itself. Previously perceived as a conservative Asian hub, the city of Singapore’s new generation are becoming more adventurous and less worried about being fined if they chew gum and don’t flush the toilet. Singapore is fast becoming the trendy hot spot of South East Asia with its ‘Durian’ – a futuristic National Theatre and Arts centre building with a roof that resembles that much-prized smelly Asian fruit delicacy. Further embracing the capitalism of the international traveller, after much public debate, last year the Government agreed the build and operation of two gambling casinos, one of which will be located near the ONE°15 Marina Club. Breaking the mould of the typical marina yacht club, ONE°15 Marina Club joins a unique string of new lifestyle-orientated yacht clubs, such as the Sir Norman Foster-designed Yacht Club de Monaco, Yacht Club Costa Smeralda and the Serrenia Marina on the Red Sea, to remind the glamour set the yacht club is the place to be. 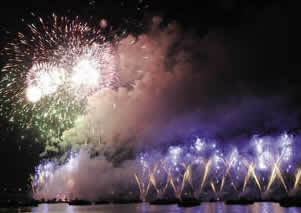 Singapore is embracing the waterfront and marine lifestyle, using the rebuilt foreshore as an event venue.